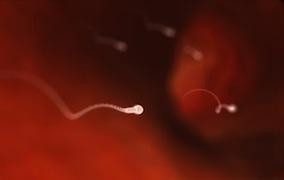 Scientists now have a better understanding of how sperm function in two discoveries that could someday improve in vitro fertilization (IVF), success rates and male contraception. Two papers from reproductive scientists at the University of Massachusetts Amherst and their international partners provide a better understanding of how sperm acquire the ability to fertilize an egg. Scientists may someday use this information to enhance or block egg fertilization. One paper describes a possible shortcut IVF specialists could use to improve success rates. IVF became possible in the 1950s after reproductive biologists realized sperm are not fertile until they spend time in the specialized environment of the female reproductive tract. There, the sperm moves through a series of biochemical stages, a process known as sperm capacitation. To improve IVF success rates, scientists must mimic these natural capacitation stages in a laboratory environment. One University of Massachusetts paper, published in Proceedings of the National Academy of Sciences (PNAS), hoped to improve one of the later stages incapacitation – the addition of calcium. Today, when scientists add calcium to sperm, the mineral seems to overwhelm and incapacitate the sperm. Researchers at U of M discovered they could introduce calcium in the earliest stages of IVF to save time then simply rinse excess calcium away. The sperm kept only the calcium it would need later and continued with capacitation. The scientists found this simple step improved IVF success rates by 80 percent in laboratory mice. In the second paper, published in the Journal of Biological Chemistry, Visconti and his colleagues investigated whether both parts of a sperm – the head and the tail – contain chemicals that ultimately create cyclic adenosine monophosphate (cAMP), which is essential for sperm motility. They found that the head and the tail of sperm contain different amounts of precursors to this substance. Scientists may someday be able to use this discovery to enhance or block the mobility of sperm. Source: Lathop, Janet. "Reproductive Biologists, with International Team, Move in vitro Fertilization Knowledge Forward." UMassAmherst News and Media Relations. 29 Oct 2013. Web. 13 Nov 2013.